It's taking me a lot longer to recover from jetlag than it did when I got to Nepal. I suppose it doesn't help too much that I stayed up purposefully until 430am this morning working on getting my photos resized so I can post a few. Then I slept until noon. However tonight I'll try to get to bed at a reasonable hour. I am physically exhausted though. It's weird. At the airport my kids gave me a HUGE hug (both of them at the same time). Sam clung especially hard, which is unusual because Savannah is usually the one expressing how much she misses me. I gotta keep this short. Here are just a few photos from the trip. 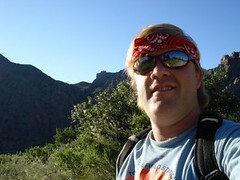 Will create a gallery at week's end after I write my article on mountain lions! 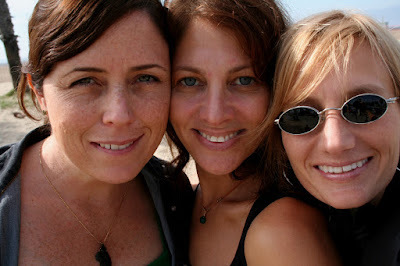 Paige, Dana and I at Malibu beach. 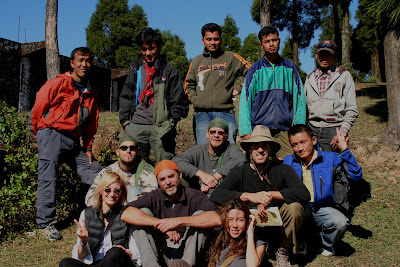 I stayed with my friend Paige on the way to Nepal. I love this photo! 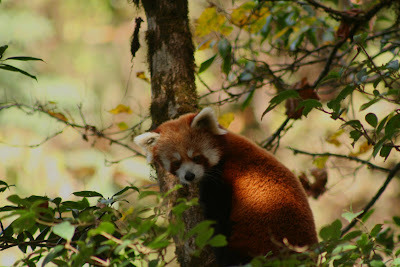 We saw 3 red pandas in the wild! They are so teddy-bear cute. It took a while to find any, then we saw 3 in the last days thanks to the sleuthful hard work of the local "forest guardians" who know the forest well and are hired by the Red Panda Project to survey and help protect the community forests. Whew! 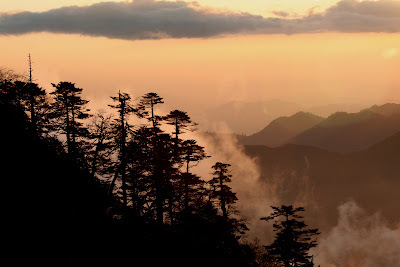 A sunset shot of mist, clouds, and a silhouette of the forests and mountains. This shot was taken somewhat near the village of Santapur at the India-Nepal border, and around 12,000 feet. 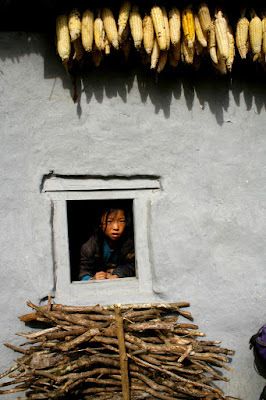 I have so many shots of cute kids peering out open windows! Love this one. 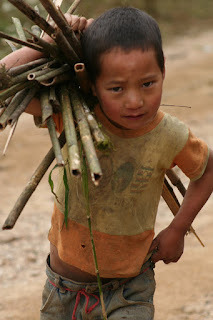 A cute Nepali boy carrying a load of sticks (probably firewood). An abstract shot of incense and marigolds inside of the Monkey Temple in Kathmandu. Althuogh it's a Buddhist temple a Hindu prayer service was being held here. 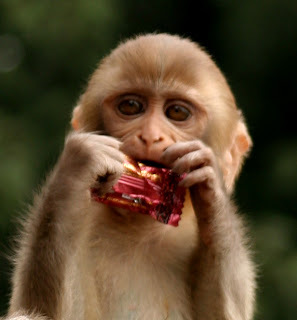 A baby macaque eating what remains on a candy wrapper. 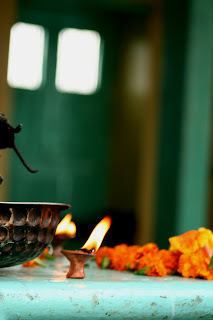 The monkey temple is so named because of the many macaques there, protected by Hindus who believe they are an incarnation of the monkey God Hanuman. 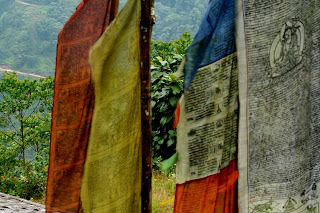 Tibetan prayer flags were common throughout Nepal. The whole group on the last day of the trip (minus Chuckles, who was sick). I had to include one photo of the Himalayas! 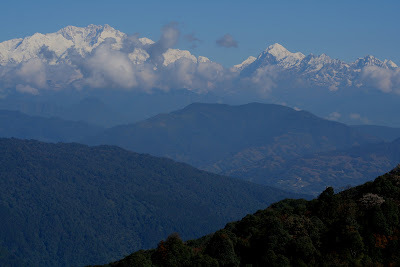 This was Mt Kanchenjunga. We also could see Mount Everest when we got to the highest spots on our trip. Clouds covered the Himalayas much of the time though. Clouds would roll in, and back out with amazing speed! And along with that came heat, cold, snow, sun, rain... all within a few hours or even minutes sometimes!